Thank you to Rainbow Music Ministries Director Roseann Penner Kaufman for writing the following guest blog post. Grandma Goertz. At least I know where my cowlick comes from. 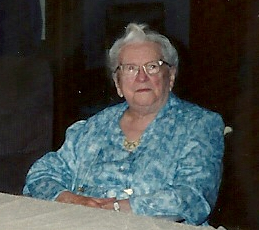 This is my grandmother, Adelia Schmidt Goertz. She is 97 in this photo, and lived 5 more years, propelled mostly by her positive attitude. Shortly after this photo was taken, I asked her how she spent her time. Her hearing, vision and mobility were mostly gone, but she didn’t complain (much). She said, “I spend time reciting the scripture verses I memorized throughout my life, but I don’t remember all the details anymore. Mostly I sing hymns in my head. Sometimes I forget some of the verses, but I just hum through those parts until I remember the words again.” Hymns were her prayer and strength. Grandma had her repertoire. I realize that if I’m fortunate enough to make it to 102, my list of sustaining hymns will be quite different from my grandmother’s. I grew up in a family that sang as a habit. My mother sang as she washed the dishes. My dad sang in the car (loudly, in German). Hymns, mostly. Texts with theology that now makes me cringe, but the tunes are in my bones, mixed in there with all the more academic and theologically and culturally diverse stuff I’ve taken in since. I now consider it part of my job to tend our congregational repertoire. Not only do I spend time each week considering how a particular piece of music fits into the theme and flow of the service, but how it serves to sustain our longer view of congregational singing resources. It’s a difficult balance, to choose what people find “familiar” (try to define that in our diverse group) as well as maintain a sense of freshness and vitality that keeps our singing energized. It feels like an important responsibility. Since 1999 I’ve kept a list of all the hymns we’ve done in worship. There are 658 hymns in the blue Hymnal: a worship book. Any guesses as to how many we haven’t sung? The answer is at the end of this blog; keep reading. As we spend time during these next few weeks thinking about worship, give some thought to your own repertoire as well. What sustains you? What distracts from your worship experience? What would you like to share that could be meaningful to others? Mostly, I hope you sing. Frequently and with joy. Here are thoughts on music from one of your most musically disabled congregants. My mother claimed to be tone-deaf. Music wasn’t part of the family culture. 1. I love how you find hymns that mystically match the message of the day. Not just the scripture (that would be easy), but they complement what Ruth says. It’s cool. Sometimes she consciously draws from your music selection when preparing her message, and says as much from the pulpit, but I don’t think that’s always the case. It’s just Holy Spirit some days. 3. I only attempt to sing those pieces that stay below F on the treble line. This is my gift to fellow worshipers. I sing with the sopranos, since I cannot find a harmony line to save my life, and often I cut out on the E. Some mornings my voice just won’t go there. 4. I love the choir. I sit there and let it bathe me in harmony, a mystery I am content to experience passively. If the words are hard to understand (such as when there is a round or fugue thing happening or the piece is in a foreign language), then I like how you often provide words in the bulletin.